For those of you who are not familiar with this crazy American holiday (or have yet to see the Bill Murray movie by the same name), every year on February 2nd thousands of excited onlookers gather in a small Pennsylvania town named Punxsutawney to find out if spring will come early or if we’ll have to wait another dreaded 6 weeks for winter to end. And how do we learn what the prognostication will be? From Punxsutawney Phil, of course, the beloved groundhog. 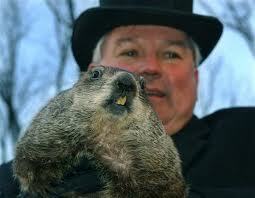 If Punxsy Phil sees his shadow and retreats back into his comfy burrow, another six weeks of winter there will be. However, if Phil does not retreat after emerging from his burrow, then we can all celebrate because that means spring will come early. Since the late 1800s, Punxsutawney Phil has seen his shadow 99 out of 115 times, sending an omen of bad weather and delaying the arrival of spring 6 more weeks. What’s the probability that we will have to wait 5 years, or even 10, until Punxsy Phil doesn’t see his shadow and we can rejoice in the arrival of an early spring? 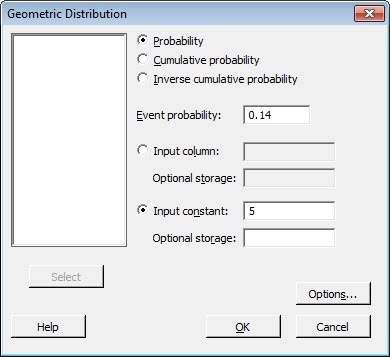 We can use the geometric distribution and Minitab Statistical Software to find out. The geometric distribution can be used to model the number of trials needed to produce an event, OR the number of nonevents before an event occurs in a series of independent Bernoulli trials (in other words, yes/no situations). What else can we use Minitab and the geometric distribution to predict?